, an eminent engraver, was born in London in 1645, and became the disciple of David Loggan, for whom he drew and engraved many architectural views. He applied himself mostly to the drawing of portraits, in black lead upon vellum; and his success in taking likenesses procured him much applause. His drawings are said to have been much superior to his prints. He drew the portraits of sir Godfrey Kneller and his brother, and sir Godfrey thought so well of them, that he painted | White’s portrait in return. White’s portrait of sir Godfrey is in Sandrart’s Lives of the painters. In 1674, which is two years before Burghers was employed on the “Oxford Almanack,” White produced the first of that series. 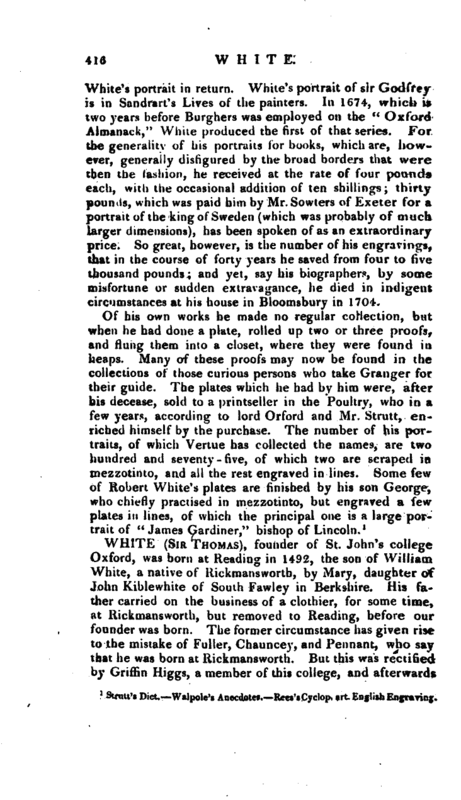 For the generality of his portraits for books, which are, however, generally disfigured by the broad borders that were then the fashion, he received at the rate of four pounds each, with the occasional addition of ten shillings; thirty pounds, which was paid hirn by Mr. Sowters of Exeter for a portrait of the king of Sweden (which was probably of much larger dimensions), has been spoken of as an extraordinary price. So great, however, is,the number of his engravings, that in the course of forty years he saved from four to five thousand pounds; and yet, say his biographers, by some misfortune or sudden extravagance, he died in indigent circumstances at his house in Bloomsbury in 1704. Strutt’s Dict. 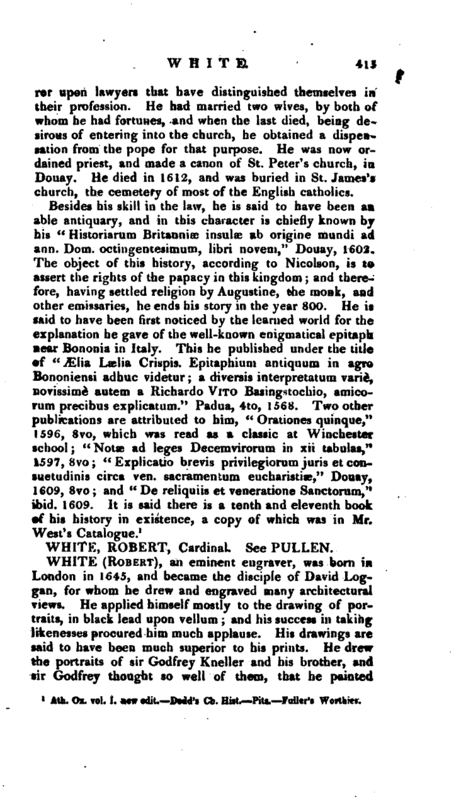 Walpole’s Anecdotes Rees’s Cyclop, art. English Engraving.